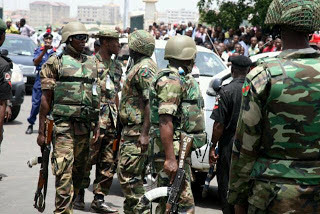 The Nigerian Army reportedly killed two suspected kidnappers during a raid on their camps in Umoubi and Umudike forests, in Ohaji Egbema Local Government Area of Imo State on Thursday. The army, in a statement issued today by its spokesperson, Sani Usman, said the camps in the forests belonged to two cult groups – De-Well and De-Gbam. One of those killed during the Thursday raid was identified as Chigozie aka “Chi boy”, said to be a notorious kingpin of one of the cult groups. The body of another suspected cult member was later discovered in the forest, the military said, adding that a number of other cult members may have escaped with gunshot wounds. The troops, from 34 Field Artillery Brigade, recovered some military uniforms, mobile telephones, and other household items, and then destroyed the camps.